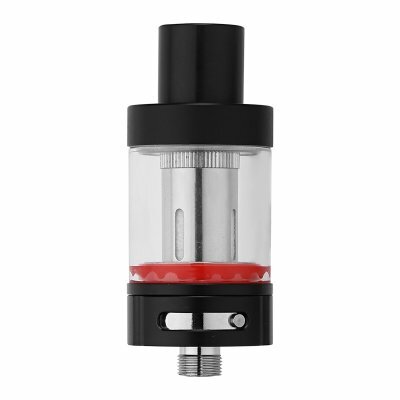 Successfully Added BetterLife Equator Tank Clearomizer - 510 Tread, 0.15-Ohm And 0.5-Ohm Coil, 2.5ML, Top Filling, Adjustable Airflow (Black) to your Shopping Cart. Upgrade your beloved e-cigarette and experience the ultimate vape experience with the BetterLife Equator Clearomizer. This powerful clearomizer features a 22mm diameter and 510 thread, making it compatible with the majority of vape mod kits out there. Simply attach the Equator clearomizer to your current box mod, fill it up with your favorite taste of e-liquid, and you’ll be all set to enjoy a powerful and tasty vape like never experienced before. Crafted out of stylish stainless steel material, this clearomizer features a durable design and sleek look. Its rebuildable design furthermore allows you to replace separate components in case necessary and it makes this clearomizer easy to clean. As a clearomizer, the BetterLife Equator is capable of holding plenty of your favorite e-liquid within its 2.5ML tank - allowing you to get through multiple vaping sessions without needing to worry about running out of juice. Thanks to its airflow control, this rebuildable clearomizer lets you manually adjust the amount of air that goes through your device with every puff you take. Adjust the airflow to your liking and you’ll be personally able to personalize the amount of taste and vapor created with each hit you take – assuring that your upcoming vaping experience will meet your exact vaping needs and demands. Featuring a replaceable coil design, the Equator clearomizer allows you to put in a coil that matches your personal style. The clearomizer itself comes with two coils that feature a 0.2-Hhm and 0.5-Ohm resistance; however, additional coils can be inserted manually – allowing you to fully personalize your upcoming vaping session. Capable of handling quite the Wattage, this rebuildable clearomizer lets you enjoy a powerful vape while delivering great taste and allowing you to create exceptionally large vapor clouds that are sure to impress not only your friends but all people in your surroundings. The BetterLife Equator is the ultimate vape accessory to upgrade your current e-cigarette or vape mod kit as it guarantees to heighten your vape experience to a level never experienced before – allowing you to take the most out of all the relaxing and tasteful vaping sessions that lay ahead. The BetterLife Equator Clearomizer comes with a 12 months warranty, brought to you by the leader in electronic devices as well as wholesale electronic gadgets..
Arabic: - كليروميزير خزان صماماته - Chinese Simplified: - Rebuildable 坦克 Clearomizer - Czech: - Clearomizer opravitelný Tank - Dutch: - Rebuildable Tank Clearomizer - French: - Réservoir reconstructible Clearomizer - German: - Reparierten Tank Clearomizer - Hebrew: - מיכל rebuildable Clearomizer - Hindi: - Rebuildable टैंक Clearomizer - Hungarian: - Clearomizer rebuildable tartály - Italian: - Carro armato di Rebuildable Clearomizer - Japanese: - Rebuildable タンク Clearomizer - Korean: - 넣어서 탱크 우리 - Malay: - Clearomizer tangki rebuildable - Norwegian Bokmål: - Rebuildable Tank Clearomizer - Romanian: - Rebuildable rezervor Clearomizer - Russian: - Клиромайзер тайтла танк - Spanish: - Autos tanque Clearomizer - Thai: - ถัง rebuildable Clearomizer - Turkish: - Rebuildable Tank Clearomizer - Vietnamese: - Rebuildable xe tăng Clearomizer.